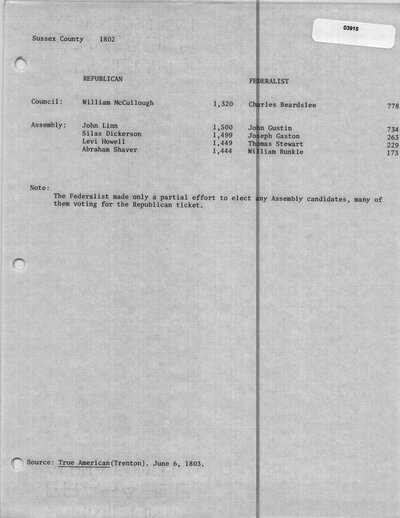 Silas Dickerson and John Holmes are on the Original Election Returns tally sheet, but received no votes. Silas Dickerson was a candidate for Assembly. "As our paper was going to press, we received information from an obliging correspondent at Newton, that the republican candidate for Council had a majority of 610 votes out of seven townships, and the majority for Assembly was much greater. So that we may safely infer that Sussex representation will be republican." The Centinel of Freedom (Newark, NJ). October 19, 1802. The Centinel of Freedom (Newark, NJ). October 19, 1802.